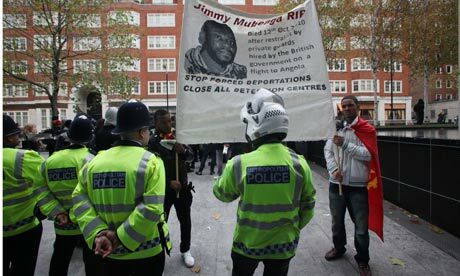 Away from the front pages was the decision by the Crown Prosecution Service not to charge G4S with manslaughter following the death of Jimmy Mubenga, an Angolan asylum seeker who died while being deported by G4S guards in 2010. According to eyewitnesses on the deportation flight Jimmy Mubenga was screaming “I can’t breathe” and “they’re going to kill me” as a number of G4S guards held him to the floor (a technique referred to by some G4S staff as “carpet karaoke” because of the screams it induces). 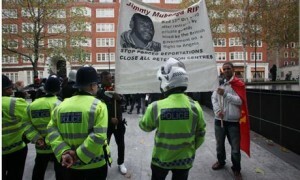 The Home Office and G4S initially both told the story that Jimmy Mubenga “took ill” not that he was assaulted. 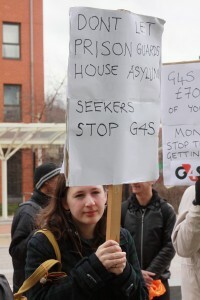 For more on G4S and the many campaigns against them, see the No to G4S blogspot and Open Democracy’s “Securing Whose World” series. Latest News on G4S sub-contractors…..
UPM have been partially replaced by the small Target Housing group who have tried to claim that they can provide a service to asylum seeker tenants even when they are working together with G4S. Their Chief Executive Officer (himself a Chilean refugee) has issued a statement posted on the website of Sheffield’s Chilean community to this effect. You might want to express your views in the comments section. SYMAAG’s John Grayson has written about how some refugee support groups and charities get co-opted (and potentially destroyed) by corporations like G4S most recently here on the Open Democracy website.